The best way to determine the value of your silver is to have an appraisal by a licensed appraiser. In order to make an accurate assessment of its value, he will want to look and handle each piece. We do not appraise here; however, we can recommend an appraiser in the Atlanta area. To find one in your area, check your yellow pages or ask a local antique dealer. Is an appraised value different from an insurance replacement value? That depends! Many choose to schedule their sterling silver separately on an insurance policy. If you have a loss and replace your set new from a department store, it would cost more than replacing it with nearly new silver from Beverly Bremer Silver Shop. Therefore, some may choose to use our price list as a reference for insurance replacement purposes as opposed to using the retail value. 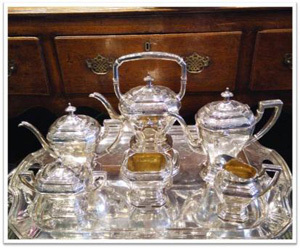 We refer all of our appraisals to Joseph P. Brady, at www.silverappraisal.com.